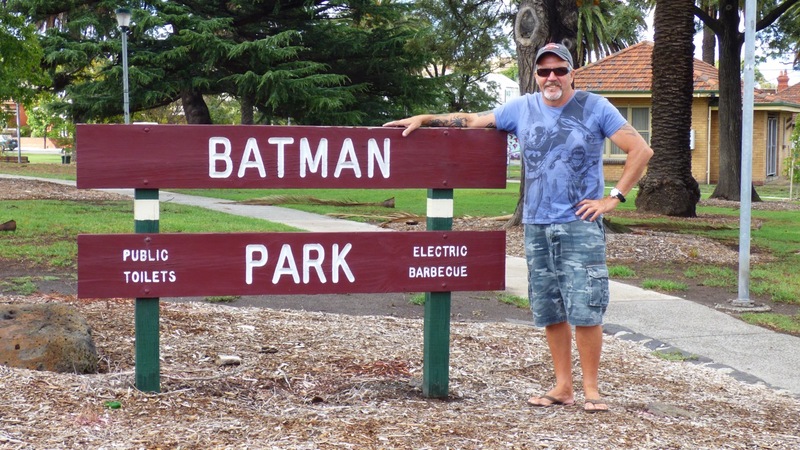 The photo of Dean standing in front of the sign at Batman Park was taken in Melbourne, Victoria. Although I have just discovered there is more than one Batman Park in Melbourne, the park we drove past was in Northcote, a suburb only seven kilometres (4.3 miles) north-east of Melbourne’s CBD. It’s on the corner of St Georges Road and Arthurton Road and not to be confused with the other Batman Park that backs onto the Yarra River, however, surprise surprise, both parks are named after John Batman, (21 January 1801 – 6 May 1839), an Australian grazier, entrepreneur and explorer best known for his role in the establishment of a settlement on the Yarra River which eventually became the city of Melbourne. Batman Park is the name of a 1.6 hectares (4.0 acres) metropolitan park. many established trees for shade and is close to buses, trains and trams. I think ‘My’ Batman Rocks.